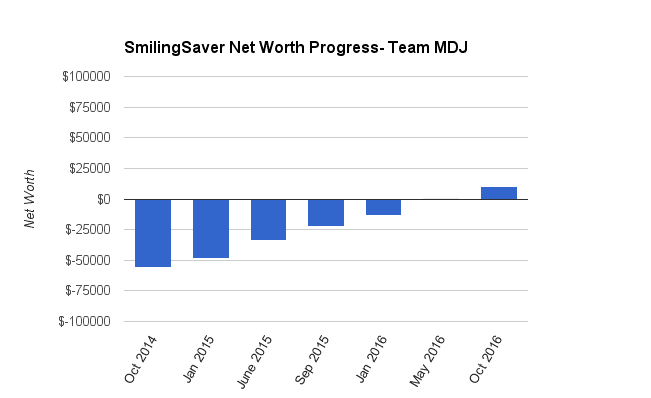 Welcome to the Million Dollar Journey October 2016 Net Worth Update – Team MDJ edition. A select group of readers were selected to be part of Team MDJ which was conceived after the million dollar net worth milestone was achieved in June 2014. SmilingSaver was selected as a team member and will post net worth updates on a regular basis. Here is more about him. Goals: New Goal: Have Net Worth equal to the value of the primary residence in 5 years. Notes: Married in May 2015. Wife graduated from school with second degree in May 2015. Immigrated to Canada 13 years ago (full story here). Debt free May 2016. So my wife and I finally figured out what our next goal should be. I know it sounds weird from the summary at the top, but I’m having a hard time wording it into a shorter version. What we want is to buy a house or a condo and have mortgage paid off. However, if an investment opportunity is there or we never decide to buy anything; we want our net worth to be equal to the dwelling we would have bought. I really like this goal. On one hand it gives us an opportunity to work on saving up more money, on the other hand we can also start looking for a great deal. We will start looking when we have enough saved for a down payment, and when my wife actually scores an engineering opportunity. She did have couple of interviews so we are hoping for a positive response. As for the financials. I did not get as much overtime this time around; however, my wife did get a few more hours at her “volunteering” position. So we are chugging along putting more money toward the TFSA. An interesting experience: for the first time in our lives we are buying Christmas presents for our friends and family early. When we see something they would really like and we have enough money saved we finalize the purchase, of course only if it is within budget. I thank everyone for their last comments regarding RRSP and TFSA. I think we will contribute towards the TFSA this year, and reevaluate this decision at the beginning of next year. I do understand all the pros and cons. The simplicity of what we are doing right now works for us and I doubt we will be buying any real estate until summer next year. So that gives us the 90 days the readers have warned me about. We have $4,177.24 in Tangerine Savings Account. It includes money that will be required for rent, cellphones, Insurance, and minor emergencies. $6,233.37 in TFSA – Invested in Tangerine Balanced Growth Funds. Actually feels really good not to have any, none at all. Check out more Team MDJ updates here. Smiling Saver makes me smile. Sorry for this silly question. How to calculate gain/loss in terms of percentage? This is awesome. Just remember that never again in your life will you have a 9700% increase in your networth… so enjoy this moment! Also about your goal to have a residence paid off in 5 years, I don’t know how you will achieve this. If the average house price in Canada is 500k, it would take you 99% of your pretax income in the next 5 years.